When I was a kid, my father and grandfather grew a huge vegetable garden. Between the two of them we had a variety of tomatoes, peas, string beans, greens, squash, broccoli, corn, onions, potatoes, carrots, and beets. There’s a picture in my parent’s family album of me holding a gigantic beet with my grandpap. 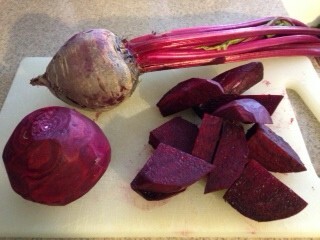 So I go way back with beets…. Beets are full of fiber and antioxidants, so if you think you don’t like beets, try them a new way. They are wonderful roasted and eaten as a side or on a salad (add goat cheese and a few toasted nuts – heaven). When it’s time to fire up the grill, try sliced beets and spinach leaves on your next burger! A taste sensation! First peel the beets, then rinse. Cut them into large chunks, or slice them into rounds. 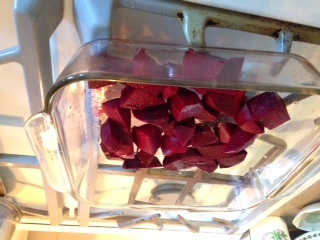 Toss cut beets into a baking dish, drizzle with 1-2 teaspoons of olive oil, add a small pinch of salt. Roast for 30-45 minutes in a 400F oven. Leftover beet tops – wash the greens, and steam in the microwave. Chop and eat as is, or add to another vegetable or grain dish. This entry was posted in Easy Cooking, Food Facts, Misc and tagged antioxidants, beets, National Nutrition Month, side dishes, vegetables by Rosanne Rust. Bookmark the permalink.